So in response to the discussion that started earlier this week about pull out sprayers, here's what I learned about Delta's new MagnaTite magnetic docking system. Thank you Laurie from Kitchen Design Notes for alerting me to the fact that these things exist in the first place. Delta has a new docking system for some of their faucet models. In these select models, Delta's placed a strong magnet along the inside rim of a few of their kitchen faucets with pull out sprayers. This magnet pulls the sprayer head back into the stem of the faucet and holds it there. Traditionally, these pull outs are held in place with a weight placed at the far end of the pull out's hose. Keeping the pull out retracted becomes a matter of gravity. So long as there's nothing for the weight to get caught up on, this system works. However, most people don't keep their sink bases free of obstacles. We have a Vinnata from Kohler in our showroom and that faucet's weight has an unnatural attraction to the Insinkerator that shares its space. If you look at thebottom left of the illustration below, you can see the weight clamped onto the hose. 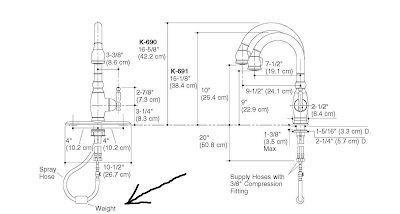 So as I know from experience, this back-weighted pull-out hose thing is a hit or miss proposition. In an ideal world, there's nothing to get in the way of the weight when the sprayer's in its retracted position. MagnaTite™ docking keeps the kitchen pull-down spray wand firmly in place with a powerful integrated magnet, so it stays docked when not in use. The pull-down spray wand comes free with a gentle tug and gives you total flexibility. The hose extends and retracts without friction points, fed by gravity. The toggle button on most wands featuring MagnaTite allows you to switch between aerated spray and stream modes. As you raise the wand to dock it, the magnet embedded in the spout pulls the wand precisely into place. So unlike other pull-downs that tend to droop over time, MagnaTite keeps your pull-down faucet looking picture perfect. Here's a Delta video that shows this system at work. It's a great idea, really. Now this MagnaTite system is only available on a limited number of their faucets, there are two of them that are Lowe's exclusives and the following four models are available through independent dealers. Independent dealers like our pals at eFaucets.com who furnished these images. Each of these four designs is available in a multitude of variations and in any of Delta's five finishes: chrome, stainless, Venetian bronze, black and white. I have no firsthand experience with these faucets and I'd be glad to hear from anyone who does. Finding non-sponsored reviews on these things has eluded me completely. It's a really clever idea and I can't imagine why it wouldn't work exactly as promised. But then again, real estate never depreciates, right? this faucet does work quite well. we just picked it for my showroom recently. and i love it. Thanks for the review Annie, that's good to hear. Have you installed one in a client's home? Welcome to Kitchen and Residential Design by the way.